Leading world lister Tom Gullick became the first person ever to see 9,000 bird species in 2012 when he saw the endemic Wallace’s Fruit-Dove in the Tanimbar Islands, Indonesia. 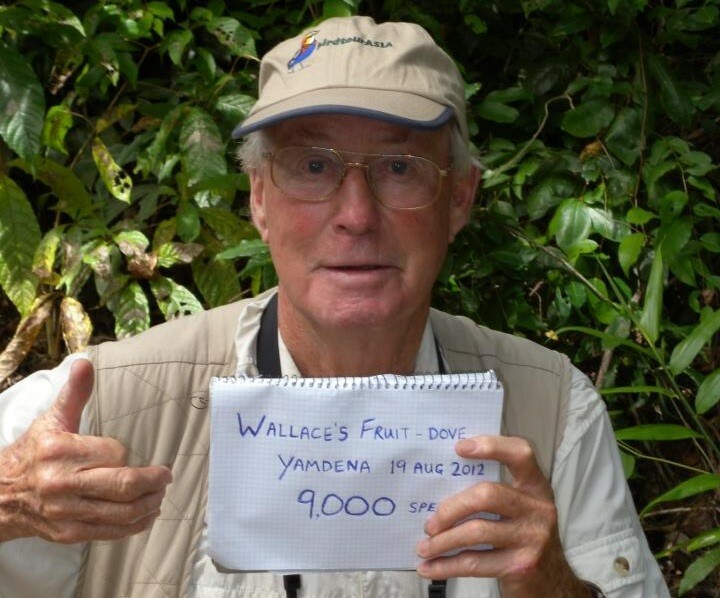 He saw 9,047 species on a bird tour there. Britisher Tom Gullick, 81, has been the top world lister since 2008 and has been birding for 40 years. For years the field was led by Phoebe Snetsinger, who avidly birded while fighting cancer, and who allegedly spent a family inheritance in the process of amassing a life list. At the time of her death in an accident on a bird tour in Madagascar in 1999, her total of some 8,400 species was about 2,000 ahead of her closest rival. There are an estimated 10,700 species of birds in the world and there are lots of birdwatchers who keep a life list of all the birds they have seen in their lifetime. Mine is somewhere between 3000 and 3500; I haven’t counted lately. So who keeps track of all this? Well, the American Birding Association, started as a club for listers, is now a conservation organization but still keeps a tally of top listers. How do we know these birders are being honest? Why not say you saw 8000 birds? Who is going to know differently? Well, there is no reason to be unethical. If you are alone and saw a bird, you write it in your life list and tell others, who will accept your word, although if it is a very unusual bird or in an unexpected place, they might gently question you. If I saw a bird but wasn’t 100% sure of its identification, I would not jot it down. It would make me uncomfortable to fudge my life list. Besides, what’s the point? I have talked to birdwatchers who have been mistaken in their identification but I can honestly say I have never known one to deliberately lie. I’ve been questioned a few times when I said I saw a so-and-so and a few times the questioner convinced me I was wrong. There may be a bird or two in my life list I thought I saw but actually did not, but I guarantee there are many more that I saw but could not definitively identify and thus are not on my list.